Barbecue Bacon Cheeseburger Chili is an easy dinner recipe with lots of flavor! 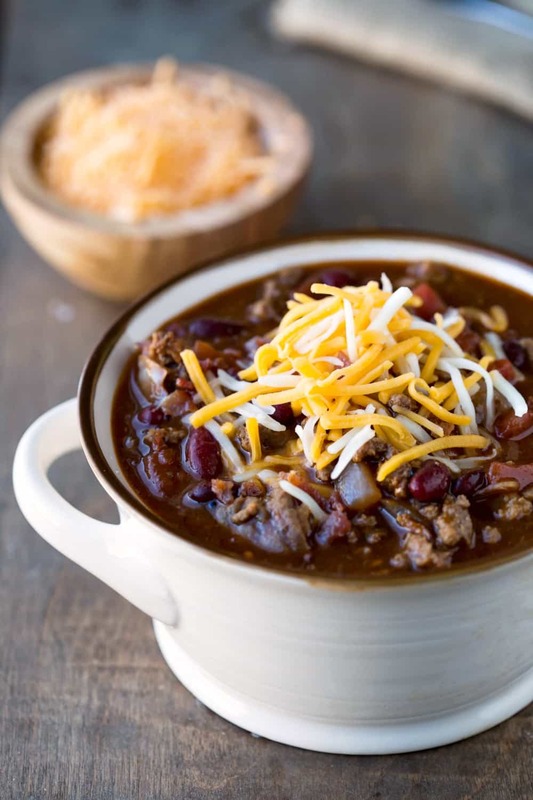 This kid-friendly chili makes a great fall or winter dinner! Chili is one of our favorite meals. I love how flexible chili can be, so I regularly make several different kinds of chili. 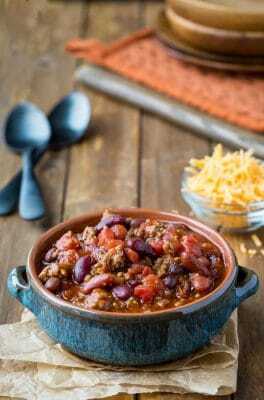 This Barbecue Bacon Cheeseburger Chili is mild but, between the bacon, barbecue sauce, and spices, it still has lots of flavor. This chili is also really easy to put together. It’s the perfect easy dinner for the coming chilly fall and winter nights! Barbecue Bacon Cheeseburger Chili is an easy dinner recipe with lots of flavor! In a large pot or Dutch oven, brown the ground meat. Drain, and set aside. Cook the bacon. Set bacon aside, and drain all but about 1 tablespoon of the grease. Cook onion in bacon grease until soft, about 3-5 minutes. Return the browned ground beef to the pot. Add the rest of the ingredients. Stir to combine. Crumble bacon over the chili, and stir in. Cover, and simmer over medium-low heat, stirring as needed, for about 1-2 hours. Serve sprinkled with shredded cheese. 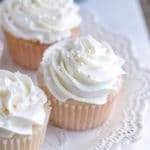 I was wondering if this recipe could be adapted to the Instant Pot? Curious if anyone has tried that? Great question! 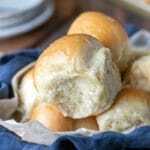 I’ve been working my way through my recipes adapting them for the IP, but this is one that I haven’t gotten to yet. Maybe someone else has tried it? Crock pots cooking tends to make chili too liquidy. 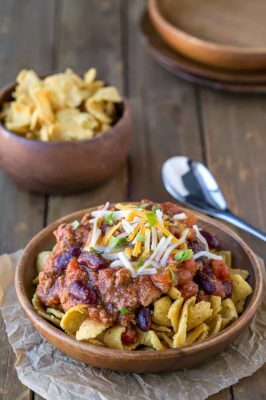 I plan to make this for my church’s chili cook off to help send Teens to a conference but ummm – wheres the cheese? Topping? There is no cheese in your ingredients list. Sorry for the confusion! I just serve it with a sprinkle of cheese on top. I’ve added that note to the recipe for clarification. Please let me know if you have any other questions, and good luck! 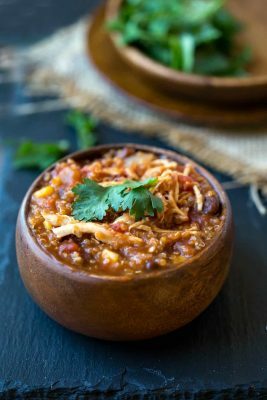 I won the cook off in the Traditional chili category with this recipe! Thanks. Congratulations!! Thank you for taking the time to come back and let me know! We used your recipe for a Chili Cook Off at work and won the People’s Choice Award. We are a small hospital in Iowa and there were about 8 other Chili’s we competed against. Thank you for such a great recipe and we had tons of fun with decorating and sharing it with our co-workers. We decorated our table with the ingredients. We had dried kidney beans for our “confetti”, and set out a bottle of liquid smoke, BBQ Sauce, plastic tomato, onion and cheese, and a rubber bacon cheeseburger borrowed from our dietitian, and a can of cocoa, plus some gummi cheeseburgers. Could you make this in a crock pot? If so, how? Also, how many people does it feed? I haven’t made this chili in the crock pot. If you try it, please let me know how it goes! 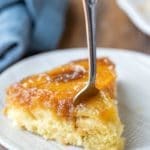 This recipe makes about 10 servings. 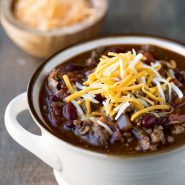 I’m going to make this in the crock pot tomorrow for a chili cook off, I’m known for my bbq so I was really excited to find a chili that I could incorporate my style of cooking into a chili! I’m so glad! I hope that your cook off went well!